Last week, when the forecast was still very up in the air, it looked like Hurricane Irma could be making a direct hit on the SC/GA coast as a category 4/5. We're a little trigger-happy with emergency preparedness here in Columbia after the floods a few years back, and since I knew I wouldn't get a chance to wait till the forecast was more clear, I headed to the grocery store to load up on water and shelf-stable food just in case. Thankfully for us, we just got lots of wind and rain, and despite a few downed trees in the neighborhood, never lost power. Our hurricane day was spent safely indoors, us, our dogs, and our bored 18-year-old neighbor who hung out and watched Netflix while petting Charlie for 2 1/2 hours straight. Since my evenings are petty packed this week and I didn't feel like braving the rain yesterday for groceries, I decided to nix shopping this week and just eat what we've got in the house - canned stuff, frozen food, and Trader Joe's entire line of snack foods. As I was sitting down to yet another reheated frozen meal, for a second, there was a little twinge of guilt. Another frozen meal?? Shouldn't you go out and get something that like, doesn't come from a can? Thankfully, the more logical, less fear driven part of my brain quickly spoke up and reminded me what a freaking privilege it was to be sitting there, safe and comfortable inside my dry house, watching Netflix with a plate of filling, and actually pretty tasty food and clean water in front of me. After spending the past couple weeks reading stories about people running out of food and water in the Caribbean, rescuers and residents wading through toxic, bacteria-laden waters in Houston to save people, pets and belongings, and hearing from clients in the Northwest who can barely go outside because of air quality from the wildfires, it felt absolutely absurd to spend a single second worrying about the health effects of going a week short on produce. 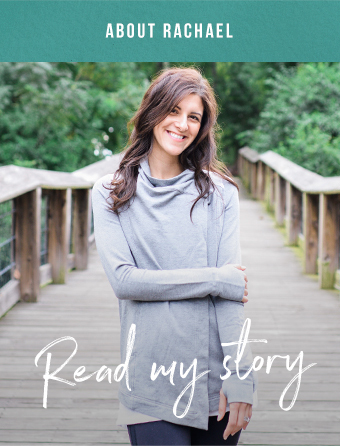 In my career as a dietitian, I've worked with clients and patients from all over the socioeconomic ladder. But since I started my private practice (in a state that won't accept dietitians onto their insurance boards -boo South Carolina insurance companies! ), most of my client base is well-off, or at the very least, secure. With that, means dealing with questions and concerns about food that are a bit, well, privileged. Is that food ingredient dangerous? Are conventionally grown fruits and vegetables harmful? Should I use coconut oil, or extra virgin olive oil in my cooking? I was so bad for eating all those chips. That's not to say you are a bad person, or shallow if you've ever thought these things. Lawd knows those are all thoughts that have run through my mind at some point in my life. There's a HUGE industry marketing "luxury wellness," feeding us fearmongering messages to make us believe their products/services/diet are essential to our health and wellbeing. And for those with an eating disorder/disordered eating, it's underlying brain chemistry fueling the obsessive thoughts about food and body, not superficial desires. But I do think it's important to reframe how we think about wellness so yoga retreats and expensive superfoods and clean eating challenges aren't taking so much mental space. Instead, let's think about what's essential for good health - social connection, access to good healthcare, a wide variety of food including lots of produce, a healthy environment, and moving our body semi-regularly (to our individual ability). And then if you've got the money to spend on a fancy smoothie powder or a bag of organic kale chips to snack on, consider that a fun extra. A privilege. I find it (sadly) ironic that so many of my food secure friends, family, and clients stress about wellness to the point where it makes them unwell, while those will less access and resources don't even have the option of worrying about things like "clean eating" or intermittent fasting or if that cookie is going to make them gain weight. They're worrying about how to get food on the table while working two jobs and if they can afford time off to go to see their doctor, let alone scrounge up money for the medications they'll prescribe. They live in communities without clean water. They live in communities without access to nutritious food. Instagram wellness isn't an option. In the end, nobody is well. 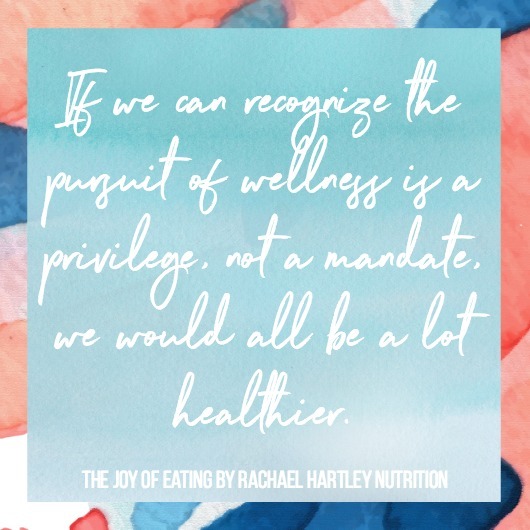 I think if we can recognize that the pursuit of wellness is a privilege, not a mandate, we would all be a lot healthier. Those of us who have the resources would stress less, and feel more gratitude for what we have, and hopefully fight harder for those with less resources to at least get the basics. Privilege isn't something for you to feel bad about, just something to acknowledge. I often recommend to clients I'm working with to volunteer at a food bank or feeding the homeless, because I think it really helps put things into perspective. I think having somewhere outside of yourself to channel energy can be healing, no matter if you're recovering from an eating disorder, chronic dieting or just trying to get healthier overall. If you're looking for a place to volunteer here in Columbia, there's Harvest Hope Food Bank and Transitions, and please let me know of any other awesome organizations in the comments. Anyway, this is a topic I've been thinking a lot about lately, and as always, would love to hear your thoughts in the comments section.